The online booking system from Royal Thai Embassy Vientiane. As expected the booking situation, after Songkran is better, I see no unusual pattern of bookings. If you plan ahead you can book now for 17th, 18th (if you fancy a weekend in Vientiane you can choose the 19th as well), the other week they just open the booking for 22nd, 23rd, 24th and 25th. Each day 200 slots, so actually no problem, just plan ahead. They changed the outlook a bit, check it out and sign up on www.thaivisavientiane.com. I had a look at it earlier today. 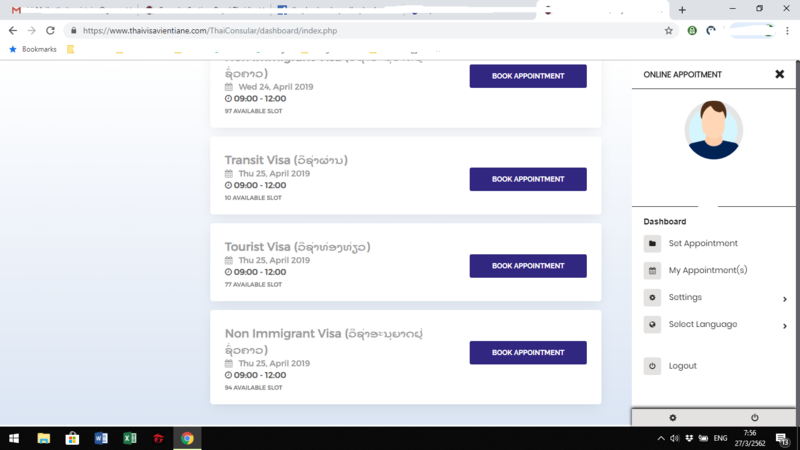 You can click "ALL" to show all appointments available now instead of having to select a type of visa and a the date. Did you notice there are no non immigrants visa slots available until late April. they split, 90 tourist, 90 non immigrant n 10 transit, every day. Have a look now , they change the outlook a couple of times a day, may be the moment you looked they did not upload the non immigrant part. I think that system is fair and everyone with a little planning can book now already. I saw the same thing yesterday. I made a mistake yesterday thinking that if I clicked "BOOK APPOINTMENT" it would allow me to select a appointment but I know have a appointment to cancel. Not sure why they have them as 9 to 12 and tell you to show up 30 minutes before your appointment time. I assume you get there between 9 to 12 you will be able to make an application. Also it appears you have to be on a Thai IP now. I cannot open the site using a VPN. The whole process is still not very well thought through. People still have to wait in front of Embassy, now they have to wait until they call the number to be allowed into that huge compound. Some people, even their own system admin played havoc with the booking system, at least it works as designed. Only problem is that people panic quickly and only read negative news. If they continue that way, people can adjust and book well in advance, no problem. Based on experience from people there, the Embassy staff has been very unfriendly towards people with even confirmed booking while having done minor mistakes. I hope that will also improve. I heard that major problem came from fake bookings that were not even cancelled or replaced with real booking.